Description:Work hard and play harder in the Driller Waterproof Steel Toe 11-inch tall men's work boot. 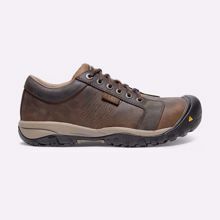 Its built for durability and comfort with a distressed golden brown leather exterior that is also waterproof for added protection against the outdoor elements. 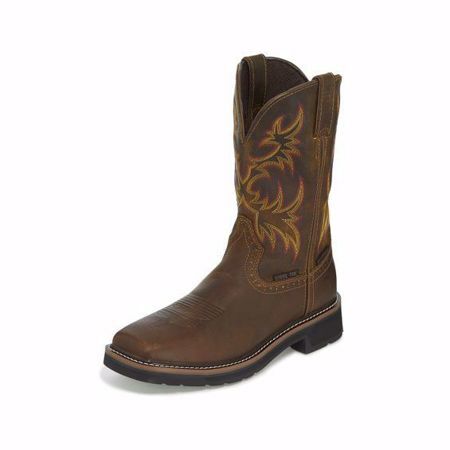 The yellow, orange, blue stitch pattern along the upper give this boot a retro feel and its steel square toe provides an armor-like shield when working in at-risk areas. The J-Flex Flexible Comfort System® insole cushions and supports the foot and the Stampede™ dual density rubber outsole provides resistance to abrasion, chips, slipping, and marking allowing you to comfortably work on any surface and meets ASTM F2413-11, I75, C75 EH safety footwear standards.